The new science of ozone and UVB is not pretty. The ozone threat is not solved, scientists say. From Zürich, lead author Dr. William Ball says Earth’s ozone shield against harmful radiation continues to weaken – despite an improvement of big ozone holes over the Poles. Thinning ozone is right over where most people, animals and plants live. It’s possible our smog is the last protection. But wait. Another study from University of California Berkeley says a weakened ozone shield 251 million years ago drove the mass extinction of forests, and all life that depended on them. Lead author Jeffrey Benca explains we underestimated the risk of significant harm from thinning ozone, and misunderstand the hidden process of mass extinction. All science from Radio Ecoshock. We all know the 1989 ban on ozone-depleting chemicals was a success. The protective ozone shield is recovering. Except it isn’t. That is according to a stunning new paper published February 6th in the European journal Atmospheric Chemistry and Physics. We’ve reached the lead author, Dr. William Ball in Switzerland. He is a Visiting Lecturer and Researcher at the Institute for Atmospheric and Climate Science at ETH Zürich. He also works with the Davos World Radiation Center. We talk about the new paper “Evidence for a continuous decline in lower stratospheric ozone offsetting ozone layer recovery” as published February 6, 2018. According to Wikipedia, ozone is “a colorless unstable toxic gas with a pungent odor and powerful oxidizing properties, formed from oxygen by electrical discharges or ultraviolet light. It differs from normal oxygen (O2) in having three atoms in its molecule (O3).” When ultra-violet light, which we cannot see, hits the layer of ozone in our atmosphere, some parts of the UV rays are removed or reduced to the level which is safe for humans and animals. At least that was how it worked until humans released ozone-depleting chemicals like long-lasting CFCs into the atmosphere. The ultraviolet spectrum is broken up into there types, according to their wave lengths: UVA, UVB, and UVC. When you apply sun-screen, you are attempting to block mostly UVB (which can cause skin cancer) and UVA (if your sunscreen includes that, read the label). UVC is pretty well stripped out even by our weakened ozone layer – but can show up in grow rooms due to certain types of light that produce UVC, which can damage the eyes. Sunglasses are not designed to protect from UVC (why bother, it’s not normally present) – so you need special protective glasses if exposed to artificial grow lights. Now you know. Ozone is distributed around the stratosphere by Brewer-Dobson circulation (and that may speed up due to climate change). At the Earth’s surface, we humans help create ozone, by providing the precursors like nitrogen oxides and volatile organic compounds, also called VOCs. Add sunlight and that becomes unhealthy smog. Does surface level ozone eventually rise up into the stratosphere, and if so, does that affect Earth’s ozone balance? Dr. Ball tells us that while that lower ozone (pollution) does not rise into the stratosphere, it DOES count as part of the total layer of protection against UVB. In a perverse way, smog is filling in for the loss of ozone further up in the atmosphere. Just as cleaning up air pollution may actually add up to 1 degree of warming, it may also increase the risk of skin cancers and blindness from UV radiation. That’s the kind of bind we are in. It is also more serious that this paper discovers ozone is not recovering between 60 degrees North and 60 degrees South, where most of the human population lives. Let’s take a small detour into an earlier paper Dr. Ball co-authored. I’m referring to “Atmospheric impacts of the strongest known solar particle storm of 775 AD“. That was published March 28, 2017 in Nature’s Scientific Reports. These are the solar storms we’ve talked about on Radio Ecoshock, the kind that could kill of parts of our electrical and communication systems. Apparently, there was a strong one in 775 AD, after the Roman Empire fell, and the Dark Ages in Europe. No computers went down that time. Ball tells us how climate change is a factor in the real state of ozone in the upper atmosphere. We also discuss the role of “very short-lived substances” or VSLSs, and their role in the ozone story. These chemicals, like paint strippers, are not in the Montreal Protocol – but maybe they should be. The “success” of the 1989 Montreal Protocol has been held up as a model of international action to solve a life-threatening environmental problem. It inspired the Paris accord on climate change. This new scientific announcement is not happy news, either for our environmental safety, or the political process. But Dr. Ball is quick to point out how the world was in direct danger if we had not implemented the Montreal Protocol. Up to half our ozone protection would have been gone by 2050. Scientists warn we are in the sixth great mass extinction event here on Earth. But it doesn’t look like it to the average person. What if extinction is not a sudden event like an asteroid hit, but a long slow decline? A new theory suggests that was the pattern about 251 million years ago, when up to three quarters of all land species went extinct. Earth deforested on a global scale, and a depleted ozone layer may have been a surprise driving force. This shatters our assumptions about how extinction works. The new paper was just published February 2018 in Science Advances. 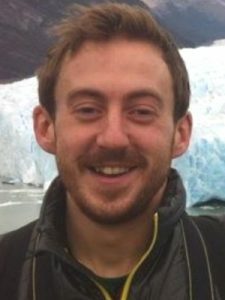 The title is “UV-B–induced forest sterility: Implications of ozone shield failure in Earth’s largest extinction.” The lead author is a rising star in ancient botany, PhD Candidate and researcher Jeff P. Benca. He’s from the Looy Lab at the University of California, Berkeley. 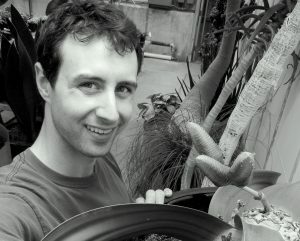 Jeff Benca, with his illustration of an ancient plant, taken from the fossil beside it (this became a magazine cover). There is a theme in this paper: a die-off may stretch over a weakening ecosphere over thousands of years, beyond the time scale of any human civilization so far. How would we know if we are already in the opening chapter? This paper makes us totally rethink how ecological collapse happens. Instead of looking for a single killer cause, we need to see a chain of inter-related events. We get to a much stronger warning in the paper: we could be underestimating the threat of thinning ozone. Strangely, the problem described reminds me of the Romans making their dishes and drinking goblets out of lead, unaware that declining mental ability in subsequent generations could result. Here too, we are dealing with a cause beyond human perception, something we cannot see except through they eyes of science. The biggest mass extinction on this planets was the Permian-Triassic extinction about 251 million years ago. The direct cause is assumed to be a long series of volcanic eruptions forming a huge region of rock known as the Siberian Traps. Other theories suggest runaway global warming was involved, due either to release of sea-floor methane clathrates, or even burning coal fields. But why did this lead to the extinction of up to three quarters of land vertebrates to disappear? This paper looks into the fate of gymnosperms. Wiki says: “The gymnosperms are a group of seed-producing plants that includes conifers, cycads, Ginkgo, and gnetophytes.” It’s worth noting that some of the gymnosperm lines have gone extinct. “We tested this proposed mechanism by observing effects of inferred end_Permian UV_B regimes on pollen development and reproductive success in living conifers. We find pollen malformation frequencies increase fivefold under high UV)B intensities. Surprisingly, all trees survived, but were sterilized under enhanced UV-B. These results not only support the hypothesis that heightened UV-B stress could have contributed to pollen malformation production, but also deforestation during Permian-Triassic crisis intervals. By reducing fertility of several widespread gymnosperm lineages, pulsed ozone shield weakening could have induced repeated terrestrial biosphere destabilization and food web collapse without exerting a direct ‘kill’ mechanism on land plants or animals. It’s possible that (a) a cause not visible to humans, or within the senses of plants, led to the death of forests (and the food webs) and (b) that instead of being “killed” they faded away, being less and less able to reproduce through seeds. A cautionary tale for all. “Had the 1987 Montreal Protocol to curb anthropogenic ozone-depleting Chlorofluorocarbons not been implements, global stratospheric models suggest a worldwide average of 67% reduction in ozone column thickness from 1980 to 2065. (48). This reduction would have been global in extent and year-round, with near total destruction of the stratospheric ozone layer in the tropics and a 550% increase in DNA-damaging UV wavelengths in the Northern Hemisphere midlatitudes by 2065. (48). Given that 34% of the world’s conifer species today are vulnerable or threatened with extinction (Fi.3 in 49), implementation of the Montreal Protocol may have prevented widespread conifer decline and potentially extirpations.“. “…Our experimental approach contributes biological data challenging the broadly popularized paradigm that ecosystem turnovers associated with mass extinctions result from kill mechanisms [catastrophic mortality for organisms] – rather than termination of evolutionary lineages. 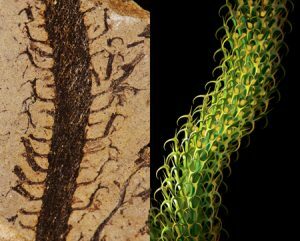 These findings, together with fossilized pollen records imply Permian-Triassic forests would have appeared deceptively healthy at many points amidst the crisis. If we make it to next week, we’ll look at another double-sided threat: air pollution is killing millions, but if we clean it up, the global mean temperature may go up as much as 1 degree C. We’ll hear what the scientists say about new research. My thanks to all who help fund Radio Ecoshock. The program is given to 98 non-profit radio stations for free, so my costs are all covered by listeners like you. If you can help, check out a few options here. Thank you for listening again this week! ← Dirty Air or Sudden Heat?